"The Chapel" was just featured in the LDS Music Today podcast! Right up front. I sure appreciate all the hard work Steve Larsen does to promote the wide variety of LDS music available. A podcast is a whopping lot of work. I've considered doing one from time to time, and each time, I've realized that I don't have the time to do it. So, many, many thanks to Steve. It's a great way to keep up on what's new in the scene. I've just about given up on trying to find a program that I can use to burn a "mixed mode" master copy of "The Third Time". I've tried three or four programs already, and none of them can produce a functioning master that will play correctly both in my computer and in my car. I may have to release the album as an audio-only CD. So, you remember all of the problems I was having trying to get a decent audio master? Well, I went through about the same hassle trying to burn a mixed-mode CD of this album to send off to my duplicator as a master. See, I'd like to have one of those cool CD's that will play in your car or your boom box, and if you put it into your computer, it will open up and have files. Way cool. That's called a "Mixed Mode" CD. I contacted the duplicator a couple of weeks ago, and they assured me that if I supplied them with an effective MM master, they'd be able to dupe it and all my CD's would have the cool files section. But I had a mess of a time trying to find CD burning software that would handle MM burning. I downloaded and tried three different softwares, all of which claimed to do it. Only the third one did. It's called "Burning Mill". Not only did it successfully handle it, but it was intuitive and easy. The first software I tried was not only complex, but ultimately unsuccessful. I went through about 5 blank CD's before I figured out that it wasn't going to work. I think that I've probably burned and thrown away about a dozen blank CD's in the attempt to get this one keeper master. Yeesh. Well, I finally found out why my volume levels from song to song were all skewampus. The CD burning software was detecting different levels and evening them out! Once I shut that off, it burned just fine. One less step! I’m just finishing up my third album (or my fourth or fifth, depending on where you start counting), and I’m at the stage where I’m mastering the songs, and choosing the order. There’s a lot of discussion about this, and a lot of theories. A long time ago, I did a lot of focused listening, and I studied how songs are ordered in the big leagues. I made a lot of notes, and much of those things I learned ended up being a part of my selection process. Here are some thoughts. A song is a song, but an album is a story arc. It starts, it journeys through the middle, and it resolves at the end. If you keep that in mind, your album will take shape in a much better way. There’s a psychological concept called “The Primacy Effect” and another one called “The Recency Effect”. Primacy states that people tend to remember items that are at the top of a list, or first in a series. Recency states that people tend to remember items that happened most recently. So, the first song and the last song (the one they’ll have heard most recently if they liste to the entire CD) are going to be critical. This also reinforces the concept of the shape that I just mentioned. Back in the day before mp3’s, I would get in my car to go to work, and I would choose a CD that I wanted to listen to on the way. I would put it in, and it play the first 3-5 songs as I went to work. Then, I would get out of the car and go to work. When I was done for the day, I would get in my car, choose another CD to match my mood, and drive away, listening to the first 3-5 songs of that collection. Do you see my point, here? The first few songs of a CD are the ones that get the most listening time. They are very important and must be chosen with care. Another reason the first few songs of a CD are critical is that they help to brand you. This is especially true if you’re putting out your first CD. The first few works that people hear and associate with you will be how they think of you. Even if it’s your second or third CD, each one will still (hopefully) help you to win new fans, and so they’ll still be the first thing people hear from you. So, with all this in mind, here’s my thought process as I shape the order of the songs on my CD. First, I think of myself as an artist, and I decide just how I want to be perceived. In my case, I want to be thought of as a classic rocker, making LDS music. If someone listened to the first three songs of this CD, what would they think of me? Since these first few cuts are critical, I choose three songs whose sound fit that image. They must be loud and driving, and must have an uplifting theme. It would make no sense for me to start off an album with a couple of soft ballads. Even though I do write and perform some softer songs, I would rather be thought of as a rocker. If you tend to make more traditional LDS music, with a softer spiritual focus, then you would do the opposite. You would not want to start up-tempo. I also pick these three songs to be my best written, my best recorded, my hook-iest, strongest songs. Since these are the ones that will get the most play, and will therefore be the most remembered, I want them to be the most memorable. In the middle of the journey, I mix it up a bit. Slow, fast, odd, traditional. The order of these songs is less critical, and will change more often as I go through the process. I want to end it on a big finish. The last song will be something big, maybe a powerful ballad or an up-tempo romp, something that will nicely summarize the entire previous dozen songs. Because of the Recency Effect, it also needs to be one of my strongest songs. It must be well-written and well recorded, with memorable hooks. It needs to help the listener feel like they just got back home after a wild ride and they can walk in the front door and kick off their shoes and relax. It might even give them something to meditate on while they're resting. Following this process can help you to make a CD with a stronger impact on your audience. It will certainly help them to get to know you, as an artist, even better. And that can change them from casual listeners into solid fans. Here's a first draft of the front cover for "The Third Time"! Comments? I'm no designer. I just have fun. I've got a couple of other possible ideas, too. We'll see which one I use. Mastering this CD has been such a headache. I'm about to just chuck it in. Remember those little surprise bits I was talking about? Well, they're really cool, but they're not behaving. I've mastered the entire CD three times, now, and I can't get the perceived volume levels to even out. It's driving me batty! I wish I could afford to just pay someone to do it! Mark's Other Blog Posts: A big, big LDS game, Free Speech? It's a very exciting time for me! 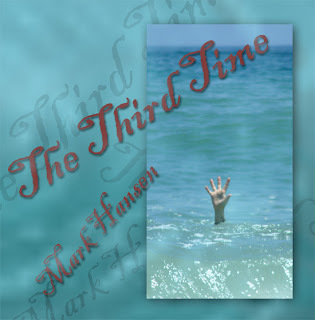 I'm almost done with "The Third Time" my next CD. I'm hoping that by the next time you receive your "Joyful Noises" announcement, it will be ready for release. The first step is getting the CD mastered, then assembling all of the shell graphics. Finally, getting it to the duplicators, and launching it! I'm thinking it will be ready by the end of October. In addition to the 11 songs that have been created along the way, there'll be some musical bits added that haven't been available as downloads, and some extras on the disc as computer files. I'm pretty excited. You can find more songs for free download at http://www.markhansenmusic.com/2009/10/songs.html, or at http://facebook.com/ldsrockmusic (click on the "My Band" tab). I'm still working on my goal of 1000 friends on Facebook! I'd love to see you all join me! Click to http://facebook.com/ldsrockmusic and become a fan! Not only do you get the latest news, but you can join in the interaction with others. As always, thanks so much for your kindness and support. If you don't want to get any more mailers from me, simply send me a note at mrkhmusic@yahoo.com, and I'll remove you from my list. Today was a very, very frustrating day. For the last two days, I've been trying to master the CD, and trying to make the songs all sound consistent in overall tone and volume level. That's tricky when the songs were done over the course of two to three years. I've burned three masters over the last few days, and they're still not balanced. For a while, I lost track of which files I was using for the mastering. So, I had to burn a couple of test CD's to play in my car and see. The upshot of all this is that I have to start from scratch with my original mix files and remaster the whole thing.